As a parent, what would you do if your only son suddenly became implicated in the horrible murder of one of his class-mates? This is precisely the question Jacob’s parents must answer. In the quiet suburban town of Newton, Massachusetts, Jacob’s father, Andy Barber, is a highly respected assistant district attorney. When the body of a 14-year old boy is found stabbed to death in the town’s park, Andy is immediately on the case. But the case is going nowhere fast and the police have no suspects and no leads. Then clues and details start pointing towards Jacob as the prime suspect and Andy is taken off the case. How well does Andy really know his own son, and just how far will he go to protect him? Defending Jacob, by William Landay is told entirely from Andy’s point of view, so all we know is what Andy knows. There is a lot of foreshadowing at the beginning of the book, setting the reader up to believe that Jacob really did commit this horrendous crime, but we never really know for sure if he’s the murderer. The descriptions and details of Jacob and his personality set you up to think he is, but Andy’s unwavering confidence in Jacob’s innocence often has you second guessing yourself. Andy is often blind to the obvious sociopathic-like traits that Jacob presents with, but I imagine as a parent, it would be hard to objectively see your child in that way. What I found most interesting about the story was that while Jacob was an extremely unlikeable teenager and seemed completely capable of killing his own class-mate, you wanted him to be found not guilty for the sake of his parents. From the time Jacob was charged with murder, his parent’s life as they knew it came crashing down. They were ostracized by their friends and neighbours, their life-savings were stripped and Andy's career was at stake. I wanted desperately for Jacob to be innocent just so his parent’s could hopefully, somehow, regain their lives back. I don’t have a lot of experience with reading legal dramas, but I really enjoyed this book. It’s a quick read at just over 400 pages because so much of the story is dialogue. The court scenes were engaging and it was just as exciting as watching a court drama on TV. 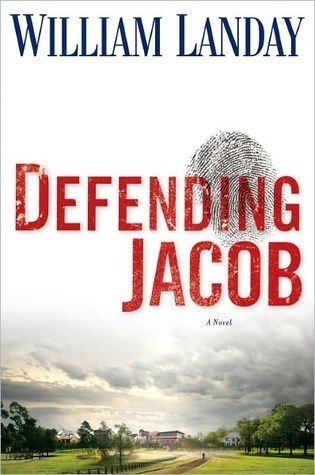 It was a suspenseful read for the most part, and I found the book hard to put down as you want to know - need to know - whether Jacob is found guilty or not-guilty. But then, just when you think the case is over and a verdict has been reached, a curve ball is thrown at you and all I can say is, I still get goose bumps when I think about it. It was definitely not the ending I was expecting and I believe it took the book from your typical run of the mill legal drama to a steady-paced legal thriller. Defending Jacob is a story full of legal mumbo-jumbo, there's no doubt about it, but more than that, it explores the infamous nature vs. nurture issue, loosely reminiscent of We Need to Talk About Kevin. A definite page-turner, and a story that had me thinking about it long after I turned the last page.